A huge match could be in the works for Becky Lynch at SummerSlam. According to Dave Meltzer in the Wrestling Observer Newsletter, a match pitting Lynch against Stephanie McMahon has been suggested for the August 11 pay-per-view event. Meltzer added that the match “is most definitely not a done deal,” but a second source in WWE told him that it is being discussed. The road to that match may have started on Raw when McMahon suspended Lynch for refusing to see a doctor, which resulted in Lynch slapping McMahon in the face. Lynch is slated to challenge Ronda Rousey for the Raw Women’s Championship at WrestleMania 35 after winning the 30-Woman Royal Rumble Match. Lynch came away from that bout with a storyline knee injury, however, and she has been reluctant to get examined since a legitimate injury previously kept her out of her match against Rousey at Survivor Series. 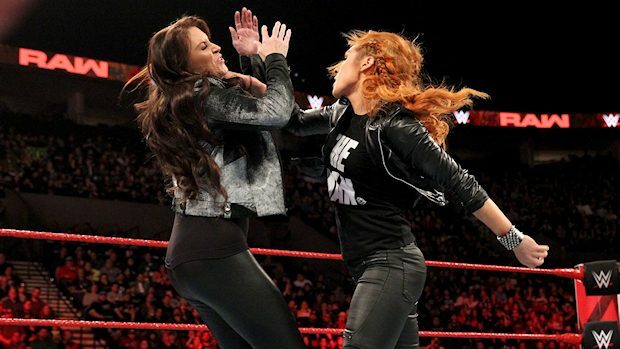 Since Lynch’s refusals to see a doctor have prevented her from getting cleared for the WrestleMania match against Rousey, Stephanie essentially gave her an ultimatum by suspending her. After Lynch attacked McMahon on Raw, McMahon kicked Lynch in her injured knee, thus adding fuel to the fire. The following night on SmackDown LIVE, Triple H cut a scathing promo on Lynch. He suggested that Becky really isn’t injured at all and her refusal to get checked out stems from the fear of facing Rousey and failing. Like Stephanie, Triple H found himself on the receiving end of a slap. Lynch added, “I would love to step in the ring with Stephanie McMahon – she’s an incredible woman and amazing at what she does in how she can get the attention of the audience.